A group of 9 parishioners from St Francis, one parishioner from Trinity Lynnwood and a guest from the USA, met at church early on the morning of 18 July 2013. We made our way to the meeting point at Holy Trinity Rustenberg (Fr Alan O’ Brien’s church) where we had a little “padkos”, all while waiting for the Tumelong team to lead us to their different projects. 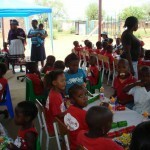 Our first port of call was the Rustenberg Child and Youth Care Centre (Secure Care Programme) which was officially opened by the Hon MEC for the Department of Social Development, Women, Children and People with Disabilities, MME Mosetsanagape Mokomele-Mothibi on 11 March 2011. We were very impressed at this obviously newly constructed facility with all it had to offer but felt that it was completely under utilised. The centre is run and managed by the Bosasa group, with a staff of 30. We met 13 young people (one young lady aged 11 and 12 young men) who are in this centre for varying misdemeanors. There is room for 60 juvenile offenders between the ages of 14 – 18 years. If they are found guilty and their sentence goes beyond 18 they can stay at the centre until they are 21. This facility includes a modern sickbay, courtroom, classrooms, and separate quarters for boys and girls. These youngsters remain at the centre until their sentence is over. 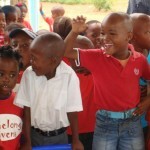 They receive schooling in literacy and numeracy and also take part in community projects. The Director of the centre Mr Solly Mphofela addressed us and indicated that once the offenders return to their communities there are no repeat offences. 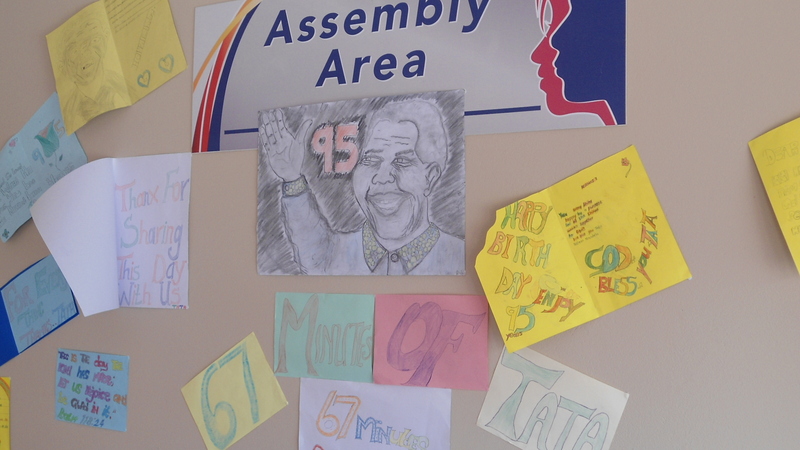 These young people had all written letters to Madiba which were on the wall of their Assembly area. Father Tim followed with a meaningful short talk on the value of such an institution lying in taking the chance one gets, to change one’s life and go out and make a difference as Madiba had done. The youngsters joyfully sang songs for us before launching into Happy birthday dear Madiba and Happy birthday dear Diana. (Yes, this is my one claim to fame – sharing the 18th July with this icon of our time! 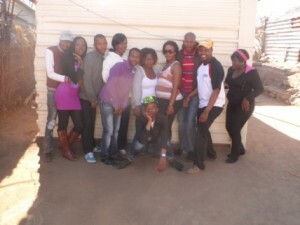 )The staff of Tumelong had brought a tree to be planted and this duly happened as well. Not to forget, we were given tea/coffee and some very interesting sandwiches as well! From here our convoy of vehicles snaked our way to Kgatelontle Agricultural Co-op. This co-op was founded in 1998 – the first phase sponsored by The Dept of Agriculture and the second phase by the Bojanala District Platinum Municipality. The land belongs to the Royal Bofakeng Nation. We met Mama Rosina Maboa and Mama Julia Mafatshe who have been at the co-op since the start. There is much potential but the buildings are in a state of disrepair having been vandalized after Eskom cut the electricity to the facility. The staff of Tumelong is hoping to source funds to repair the damage, and so be able to employ better security, so that the land can be successfully farmed. Finally we made our way to Rakatane Place of Safety in a large house in Tlhabane but on our way there we had a quick stop to see St Andrews Anglican Church which is under major reconstruction. Mama Tiny Rakatane the owner of the house fosters 10 well cared for children ranging in age from 3 – 14, two boys and 8 girls. She does not get all the grants she should receive due to bureaucratic red tape but is assisted during the week by helpers from a Community Work Program (restoring dignity through opportunities) which is sponsored by Cooperative Governance. They do the housework, cook meals, and do the laundry, so that Tiny can concentrate on looking after her children. Even though the home is quite large all 10 children and Tiny sleep in one bedroom, top to tail! 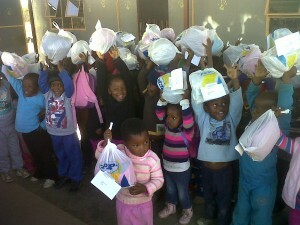 Tumelong took food parcels and we donated various non perishable foods, blankets (from Trinity), and the birthday cake. 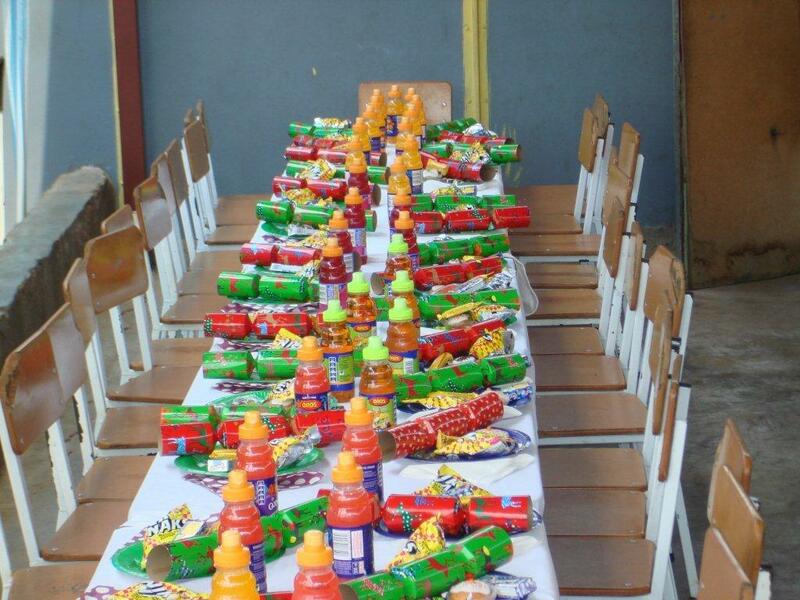 Our lunch was kindly provided by the ladies of St Andrews and Tumelong provided the drinks. We were not the only visitors bearing gifts. When we arrived there was a group of women from Anglo American Platinum – Women in Mining, who had given a food/lucky box to each child and were busy painting the bedroom wall. Elizabeth Boje had much fun adding her hand print to the wall! 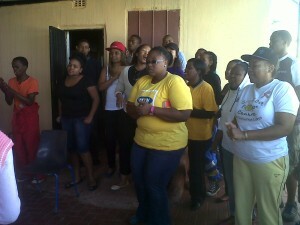 And as we left Rakatane the next group of women from platinum mine came to join in the fun of Madiba Day. This was a really fun day spending time together learning about what goes on in a community not too far away (1 ½ hour drive) and hopefully spreading cheer and hope to the youngsters whose lives we touched in some small way. 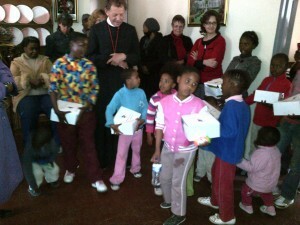 The outreach programme started at around 11am. 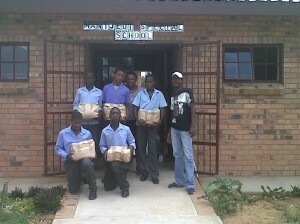 Tumelong was represented by Mr L Mthembu who brought 20 food parcels and 11 bags of clothes. 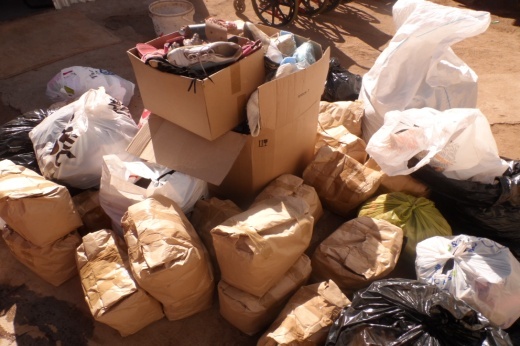 Madibeng Anglican Archdeaconry Youth also donated clothes to the Centre. We were asked to bath the kids. After bathing them we then cleaned their wheelchairs and washed their clothes. I would like to thank all the youth members who attended the outreach leaving everything that they had to do on that day to come and help at the care centre. June Blanche Grant, the youngest of five children, grew up in Cullinan and later in Pretoria West. 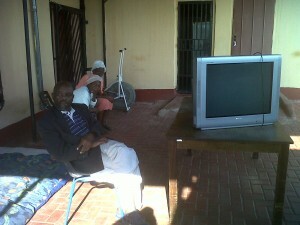 Here the family worshipped at St Saviour’s Anglican Church, where the offices of Tumelong are now located. On leaving school, June worked at Iscor in the Accounts Department. This is where she met her future husband, Johannes (Joe) van der Merwe. Joe studied extra-murally at the University of Pretoria, gaining a BCom degree and eventually qualifying as a Chartered Accountant, but remaining his whole working life at Iscor. Joe had become a committed Christian while still at school and joined the Anglican Church when he married June. The couple had two children, Olivia and Leslie. The family moved to a house in Groenkloof in 196?. For a while they continued to worship at St Saviour’s, but also started attending the newly built church of St Francis of Assisi in Waterkloof, where they soon became involved in leadership roles. June taught in the Sunday School, eventually becoming the Superintendent, while Joe became a lay minister and a member of parish council, twice serving as church warden. June was also a founder member of the St Francis Craft Group. The members used to gather at one of their homes, where they shared their expertise and learned new crafts. June was a good knitter and a keen painter. She also pressed flowers, using them to create greeting cards and calendars. The ladies sold their wares and used the money to equip the new kitchen, which had just been built at the church. After this initial project they continued meeting, putting their talents to work for various Church charities, until the plight of the Tumelong Aids orphans was brought to their attention. From then on they concentrated their efforts on bringing these children a little warmth and joy, knitting them jerseys for the winter and giving them a Christmas party at the end of the year. 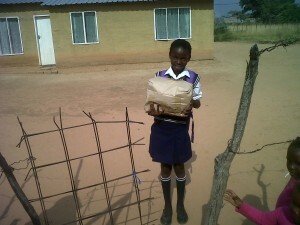 We from Tumelong could like to thank June for her kindness and generosity. 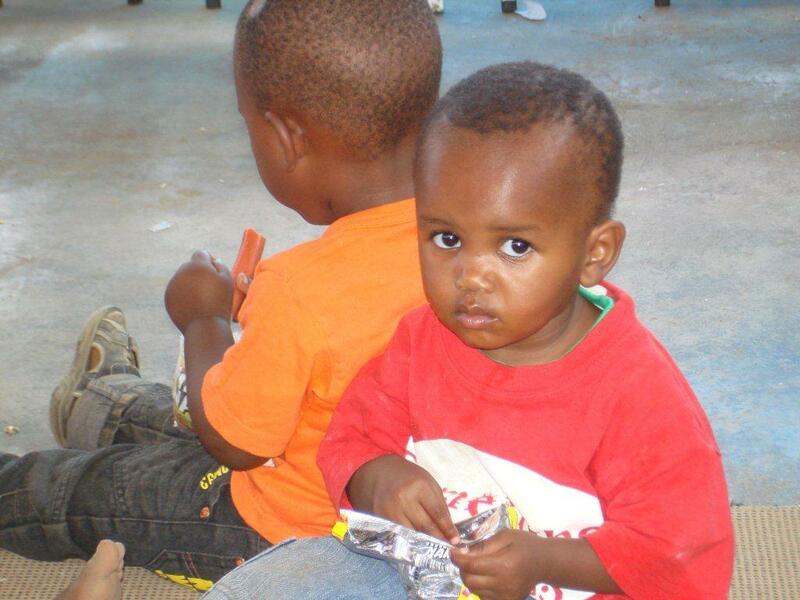 Her contributions brought smiles to our children at Maboka Haven and (ECD) Early Childhood Development at Garankuwa. 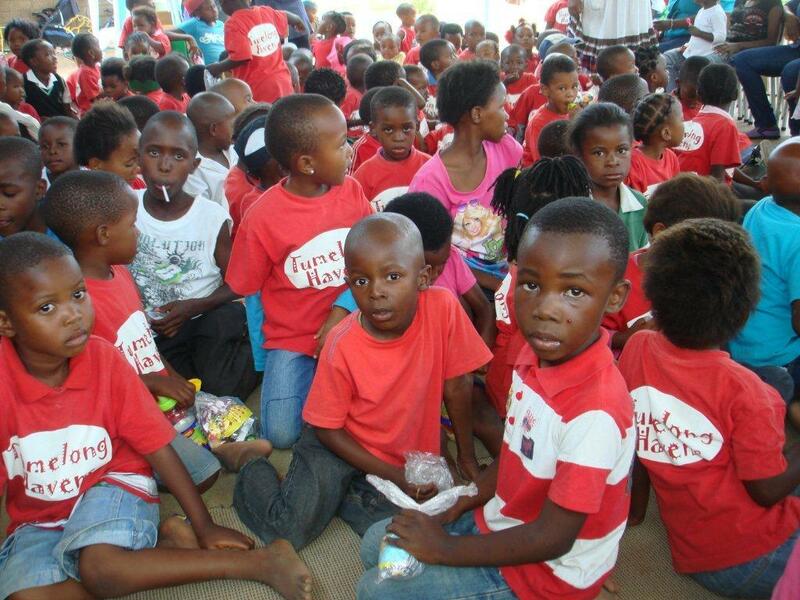 June and her group played a vital role in June 2012 by organising Track suits for Maboloka Haven children. 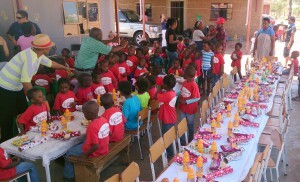 She also helped with organising a Christmas party for our ECD at Garankuwa. Her contributions in helping the poor and the marginalized will be highly missed. On 27 April, the St Albans, Cathedral Youth together with Tumelong Mission and St Albans social development undertook an outreach program at KIDS VICTORY MISSION. We started the day with praise and worship,and a scripture reading from Psalm 23 which was lead by the youth’s worship officer, Ms Kea Mafatle, this was a wonderful and uplifting moment for both the residents and us, we felt the Holy spirit surrounding us. We then Proceeded to identify the problems the shelter faced on a daily basis, the home is not in a pleasing state at the moment and it needs serious attention. Restoration is needed from the kitchen to the bathrooms. 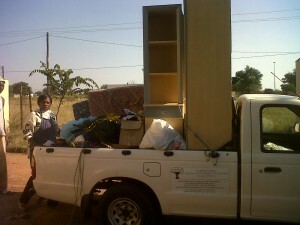 The home is in need of warm blankets, clothing, curtains, pillows, mattress, and linen, not forgetting a first aid kit. We then divided our selves in groups, and cleaned the walls and the back yard. When we left there was a huge difference. 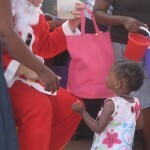 This was an eye opening event as most of us felt humbled by the glowing smiles of the children and the elders there. 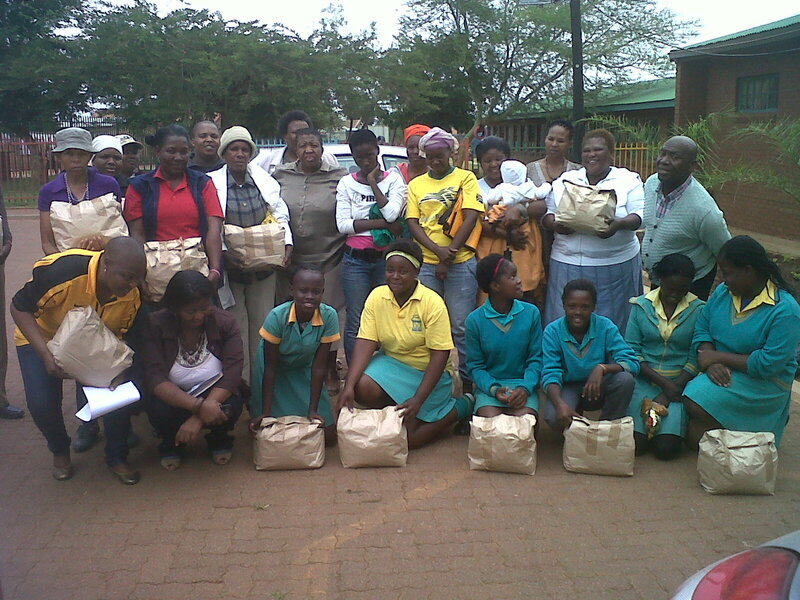 Tumelong Mission continues to touch life’s of the needy and unprevilaged. Kids Victory Care Centre is an organisation that takes care of the old aged, the physical and mental challenge children from ages of 1- 18. The organisation is under the leadership of Rose Maake who has passion in making a difference for her community. 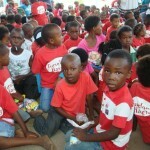 She opened kids victory care centre on the year of 2009 which is based in Madidi Lekgale in northwest. 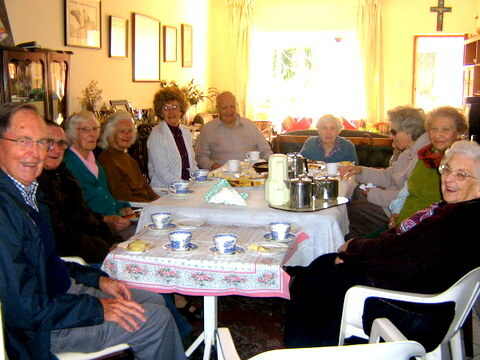 Rose knew the hardwork she had to put in establishing her organisation to be a success, she had to convice the community and families of the old aged and disabled kids. 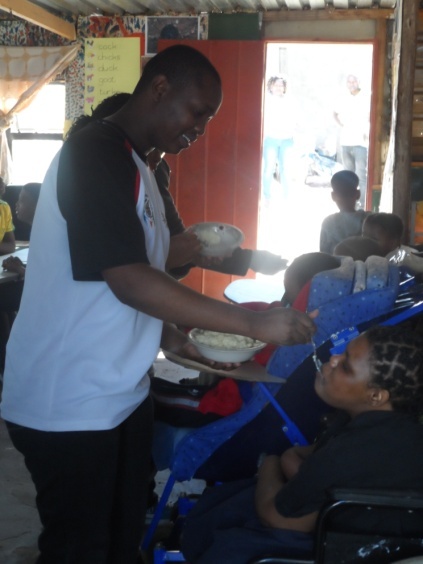 Through her courage and determination, the community learned to trust her, the organisation cares for 13 oldaged and 5 disable kids. The organisation has 13 dedicated young people who are willing to work without a stipend, but only a little to get them going. Tumelong Mission was approched by Rose in a request of help, based on a desperate need of food. 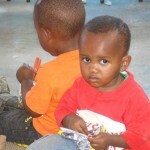 We went to the center to evaluate on how we can help and we were able to notice the desperate need of our assistance. After few days of our last visit, we came back with a number of 21 food parcels. We would like to thank, all the parishes who continuesly donate food parcels to tumelong mission, without you life’s can never be touched. 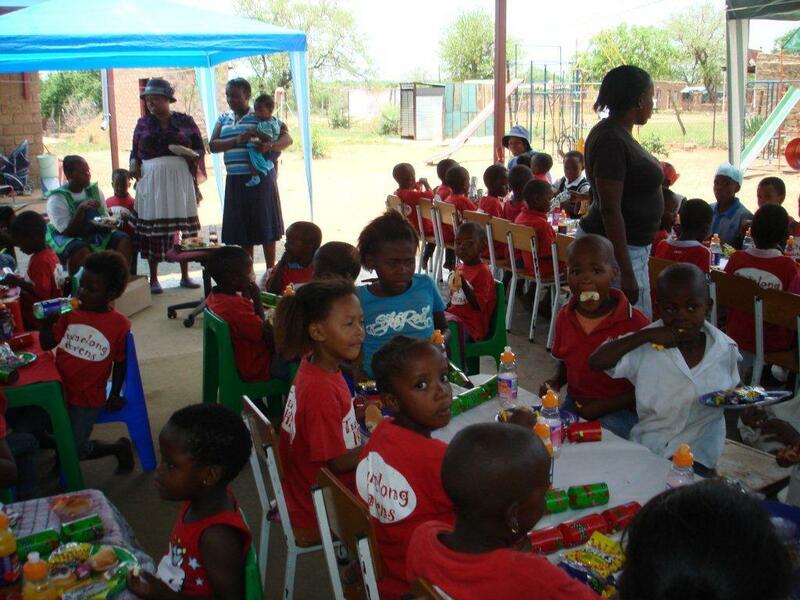 In the month of November 2012 Tumelong Mission partnered with Anglican Aids Health Care Trust (AAHT).The aim of the partnership is to assist 8000 orphans and vulnerable childdren with food parcels and school uniforms. Tumelong Mission was able to package 8000 food parcels which will benefit 2000 children in our diocess and 6000 in other Diocesses all through the Country.Tumelong Mission was also able to help 1000 children with food parcels and we still aiming to assist more with food parcels and school uniforms by the end of April 2013. Clare’s Tumelong Visit…….my last week! Dumela for the last time…..
After a month that has flown by, the end of my time at Tumelong has now come. I have had a great last week and like all the other weeks it has been busy and interesting. Party planning took up a lot of time and on Monday I spent most of the day at June’s house again, with Jill and Diana packing over 100 party bags, each having fizzers, lollipops, chips, biscuits, chomps, smarties, marshmallow fish and mice (my favourites!!) a bottle of oros drink and other little treats each, some quality control was needed as the packing took place to check that everything tasted as it should. 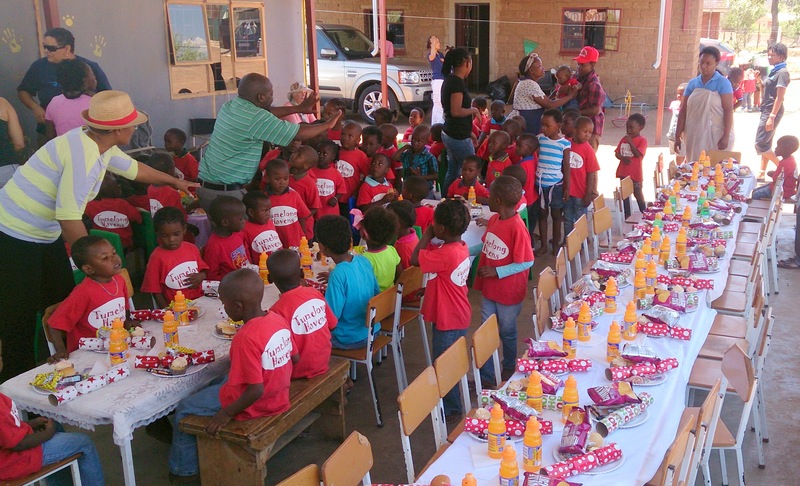 We also met with Alma Grobler from Wimpy at Woodlands who confirmed the numbers and what she would provide for the party, each child would be getting a Wimpy burger and drink which was a fantastic contribution. So the food and party bags were all sorted, all that Tshego and I still had to do was go out and get an individual present for each child!! 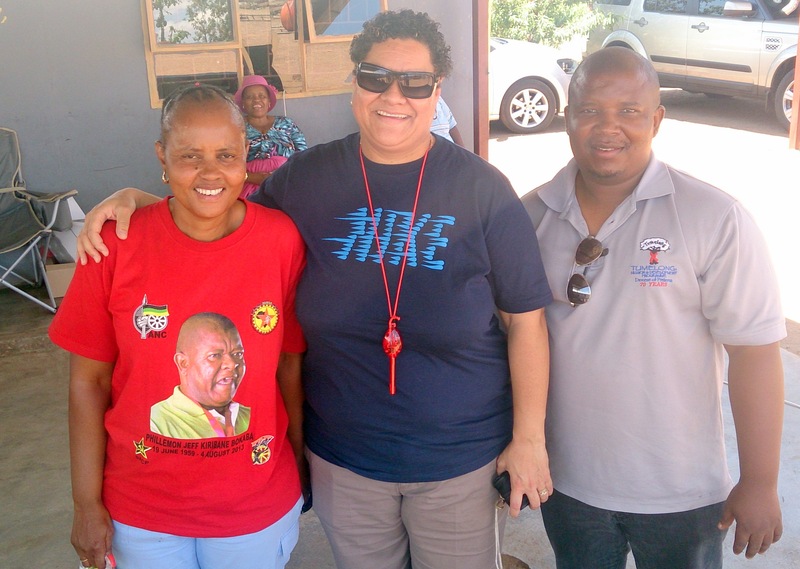 On Tuesday Lucas and I spent the day in Rustenburg with Lorraine who is a field worker for Tumelong and helps with a number of projects for the needy in the area. We visited Mama Tiny who looks after 10 orphan children from 1 year to 11 years old. Mama Tiny looks after the children like they are her own and has made her home theirs, with all of the children living like family as brothers and sisters, I was exposed to 10 of the 1000’s of orphan children, many who are not as fortunate as these who have a roof over their heads and food on the table every day. We visited Lebone 2 school, which was amazing and gave a glimpse of what the future could be like with a mix of all children studying, doing sport and playing together at a wonderful school in great surroundings. The Royal Bafakeng Football Stadium in Rustenburg was upgraded at a cost of millions of rands for the football world cup and the inhabitants live in its’ shadow, it makes you wonder about the wisdom of spending money on a football competition when a huge number of the population are without proper housing and living in poverty? Lorraine is doing great work in the community, there will be a more detailed piece on her and the work she does on the website soon. Wednesday, Tshego and I spent most of the day at Ga-Rankuwa shopping centre and were able to buy 152 gifts to ensure each child that attended the party went away with something specially chosen for their age and gender. It was quite a day, but we managed to succeed in getting all the presents we needed! 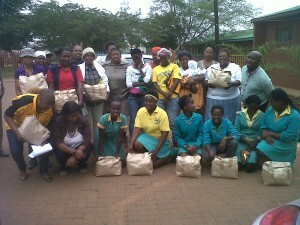 Tshego and her team at the care centre then proceeded to label each bag and ensure the correct present went in the correct bag! Finally the big day arrived and it was party time, however before heading off to Ga-Rankuwa I met up with Lucas at Irene Home first thing in the morning to have a look at the vegetable garden project proposal. We met with Lesley from Irene Home and Henico Alberts from Starke Ayres garden centre to make plans for the use of the 652 planters available for use to grow baby marrow, spinach, beetroot, tomatoes and green beans. The plot is on ¼ of a hectare and has irrigation and is covered with netting to keep warmth in and birds out! Once the initial work of planting is done the plot should become sustainable and will be a great asset to Irene Home and Tumelong, with produce being sold for income to the gardeners, and also providing for the kitchen for the home and as additional food to the needy distributed by Tumelong with the food parcels. This project has great potential and is getting help from Henico in training the gardeners and advising on how to work the plot to get maximum return from the work put in, Starke Ayres are also very generously donating the first seedlings to the project. More on this project on the website soon. Next off to Ga-Rankuwa for the party. Tshego and her team had worked through the night to get everything ready and prepared for the big day, the jumping castle was up and running and the shade tent had been put up in the care centre, with chairs from St Peters Church set out and ready for the dance performances later in the day. 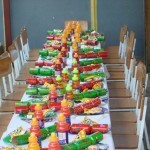 The day started with all the children having fruit and snacks before lunch, then Diana and Ursula arrived with the Wimpy burgers and drinks for the children, it took quite some organisation to get each child their lunch but we managed and as well as feeding over 150 children we also had our lovely Mother’s Union join us, and the Priest from St Peters and a good few others, but there was plenty of food and drink for everyone that joined us. The under 10’s all joined in a few games of pass the parcel which caused great excitement, we ran out of time for musical chairs but Tshego now knows how to play and will teach the children during after school care. The dance performances were all excellent and then the afternoon was rounded off with giving each child their party bag, present and a cupcake before heading home, happy, full and with big smiles all round. It was an amazing and special day and I have promised to make the party an annual event and hopefully expand to give every child in the Tumelong programmes a special party day. My last day at Tumelong was spent in the office, it was a good time to look back on all that I had experienced with the team, the places I had been, the people I had met and the memories I would take away with me. 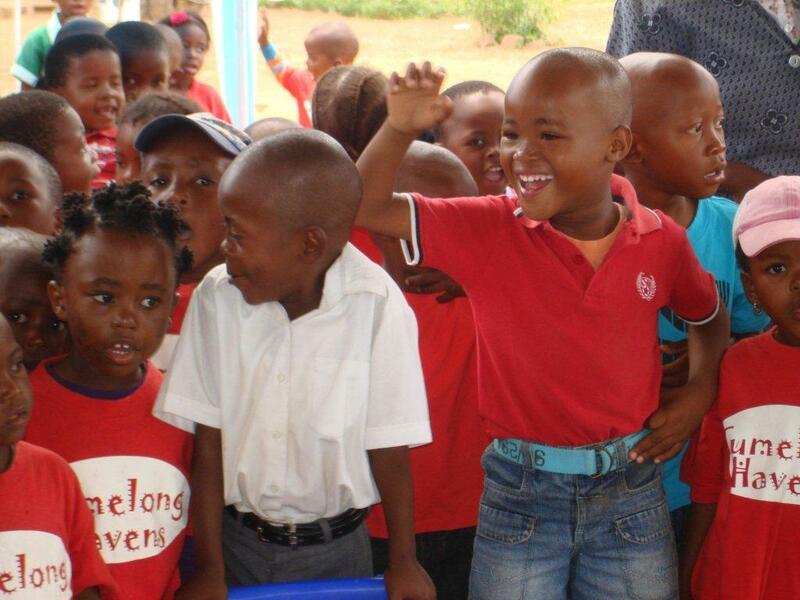 I very much hope to be back next year and to see Tumelong thriving! What another great year and how fitting to end the year on a high! Our annual Christmas party was once again a successful event. I am stunned at how the numbers keep growing each year and how each year God blesses us with donations both from corporate and individual households. Our journey started from Corpus Christi with vehicles loaded with presents, eatables, pottery goodies and lots of elves to assist us with our event of the year!! What a delight to arrive to the sound of children singing, clapping and dancing to welcome us to their humble abode. 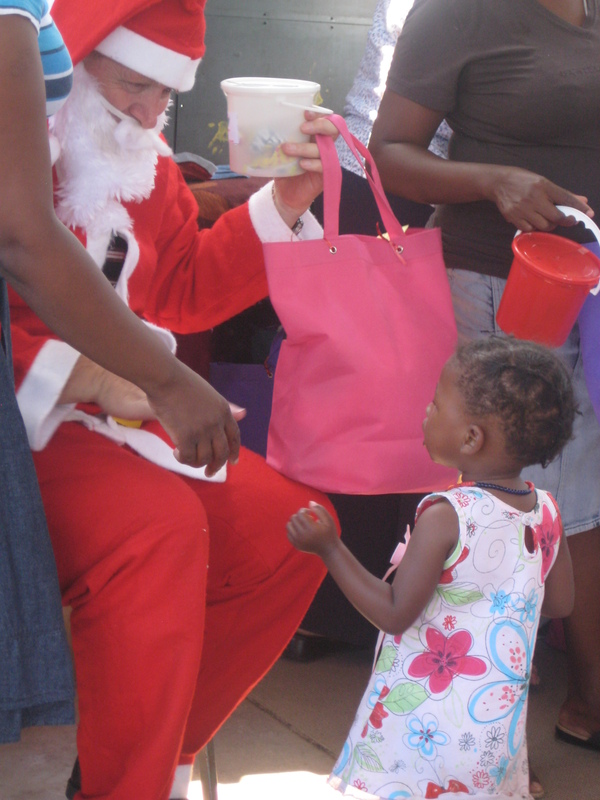 While the kiddies were enjoying the lovely snacks and lunch, our resident Father Christmas Graham Harrington was dressed in his attire to delight the kids and hand over their presents! Oh what joy on the faces when he appeared…followed by more songs of praise and a few tears from children who were afraid of Father Christmas. As we open our hearts and pockets for the Christmas party each year, we should be mindful to do so throughout the year, the Haven is in serious need of necessities for their kitchen and well as for the school. The food parcels feed approximately 80 percent of the children’s families at the school, it’s important that we make this part of our monthly giving. As God blesses us we should be a blessing to others. As we departed our hearts were filled with joy and gratitude to be able to share the most humbling experience with the special children and caregivers of Maboloka Haven. My prayer is that the Lord will continue to bless the work that our team is doing, which is deeply humbling!